Luke Healy was first on The Comics Alternative at Small Press Expo in 2016, where he briefly spoke with Derek about his provocative self-published minicomic The Unofficial Cuckoo’s Nest Study Companion, which was nominated that year for an Ignatz Award. A couple of months later Luke came back on the show, this time for a long and more in-depth interview about his new book at the time, How to Survive in the North, released from Nobrow Press. And now, Luke comes back on podcast to discuss his most recent work. His brand-new book revisits some of his older writings and places them within an entirely new context. Permanent Press has just been released from Avery Hill Publishing, and it’s a mock autobiographical text that explores the world of independent comics creators and the relationship between a cartoonist and his ego. What’s more, the new book incorporates the previously self-published The Unofficial Cuckoo’s Nest Study Companion, but it does so in a way that brings a fresh perspective to the story and even underscores its experimental nature. In this interview, Derek talks with Luke Healy about the origins of Permanent Press, its highly satirical tone, and the process of looking inside of himself and pulling out a narrative that is not entirely autobiographical, but at the same time, not purely fiction. As you’ll hear, Luke is certainly one of the medium’s most meditative creators. On this interview episode, Derek talks with Luke Healy. His new book How to Survive in the North comes out in the U.S. this week from Nobrow Press. This isn’t the first time that Luke’s been on The Comics Alternative. Derek spoke with him briefly while at SPX back in September as part of the on-location series of shows. But now, Luke’s back for a more sustained and focused conversation. Over the course of the interview, the two discuss the genesis of How to Survive in the North, the intersections of history and fiction, a cartoonist’s responsibilities concerning research and reportage, and the distinctive qualities of both mini- and long-form narration. Derek also asks Luke about his writings for small comics anthologies, including his own efforts with Dog City. On this week’s episode, Derek and Andy W. are back with a Publisher Spotlight, and this time the focus is on Nobrow Press and their fall 2014 releases. This relatively small, UK-based publisher may be off of many readers’ radar, but they put out a lot of great books, as this week’s show will attest. First, the guys discuss Jesse Moynihan’s Forming II, the follow up 2011’s strange, whacked-out creation narrative Forming. They are fascinated with the myth that Moynihan has created, and they especially love the artist’s sense of humor. 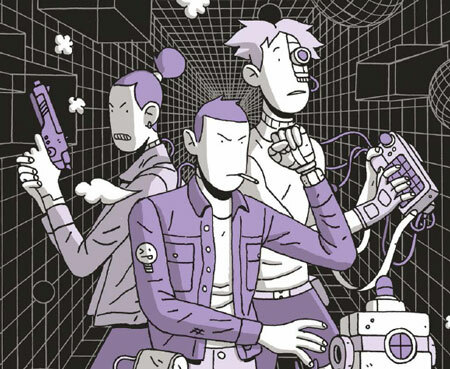 Next, Derek and Andy move on to Moonhead and the Music Machine, a new graphic novel by Andrew Rae. They highlight Rae’s clean, vivid art style, and they speculate on whether or not this book was intended for a younger — or at least all-age — readership. Next on the guys’ plate is Roman Muradov’s (In a Sense) Lost and Found. This is a striking, Kafkaesque narrative with an uneven, dream-like quality. The intended murkiness of the tale may complement the dark palette that Muradov uses, as the guys find many of his images difficult to decipher. Bianca Bagnarelli’s Fish is the next book they discuss, a short story — perhaps more of an emotional vignette — that is part of the 17×23 series, Nobrow’s graphic short story project designed to introduce young artists to a wider readership. Andy and Derek then move on to Corinne Maier and Anne Simon’s graphic biography, Marx, which looks at the (surprisingly bourgeois) life behind the famous philosopher/economist, and then they look at Behold! The Dinosaurs!, Dustin Harbin’s beautiful concertina that challenges the guys’ definition of “comics.” Finally, your tireless hosts look at Jamie Coe’s Art Schooled — one of the most sophisticated narrative styles of the week, and definitely Derek’s favorite — and then another graphic biography, Robert Moses: The Master Builder of New York City, written by Pierre Christin and with art by Olivier Balez. There are eight books discussed in all, and this show has to be extra long this week in order for the guys to cover everything. Come and enjoy the creamy filling that is The Comics Alternative!